What follows was actually published in a ‘scholarly’ journal: "After noting that girls lag in areas of physics that deal with projectile motion, the article reveals: “Like many parents [we] have observed the great delight young males take in urination, a process by which they produce and direct a visible projectile arc. ... All this is experienced up to five times a day, so by 14, boys have had the opportunity to play with projectile motion around 10,000 times. And 14 is when many children meet formalised physics in the form of projectile motion and Newton’s equations of motion for the first time. Sure, we lil' pioneers always thought only of Newton and parabolic trajectory, when conducting a hydrodynamic contest (for max height, of course) against any nice wall, or tree, in a jolly pack. What exactly was that ominous, rising up and thickening shaft - and its up-moving tip bulging - mushrooming over the atoll of Mururoa? What exactly was the ejaculatory, I mean, parabolo-triumphatory out-projection of a slender, stiff, uber-long structure - its bulbous tip endowed with a precious load - from the Earth out towards the Moon? July 16, 1969? Just "one giant leap" on July 20, eh? The totally unjust, contra-equalizatory penilo-urinatory endowment of the social construct "man" has grave consequences! Captain Craptek... remember that summer you valiantly served as The People's Peeguard™? I've never seen you so happy! At least now we know what makes Hillary the smartest woman on earth. But male projectile arc can also be for the greater good. It turns out, we were right to demand equality of sexes with regards to projectile ballistics on the Kellogg's production line. So I guess the main point of that scholarly article is that boys aren't necessarily born smarter, it's just that greater knowledge comes from greater experience. That would be my conclusion. Nurture wins over Nature this round, which is great news for the Kollective! We just need to add some remedial classes at the reeducation centers. Have we all forgotten so quickly about these Heroes of the Motherland™? Comrades, do you remember who held the White House record for Distance for 7 years running (after Reggie Love was dismissed)??? Ballistic equality has once been achieved in the Soviet workers' paradise. Talk about "paradise lost..."
This wouldn't have happened if she weren't ballistically disadvantaged. But, but, here the torturous hydro-ballistic urinatory injustice of white man's impyerializm, shame! In this video, Chelsea Handler doesn't mind some ballistic disparity, even seems to enjoy it. Outside of this video, she may as well be decrying the growing ballistic gap that has only widened since Trump became president. um, retroactuationally effectuated vanity-induced deprivilegatorial unballisticity in a dude dud? I have to admit I didn't know who Jason Biggs is and had to look him up. I am kind of surprised that a person that can just blatantly whip out his ballistic privilege and proceed to show his superiority urinating in someone's face would have a problem performing with a trio of prostitutes bought for him by his wife so she could sit on the end of the bed eating chips while she watched. Capitalism, is there anything it can't do? but.. but.. doesn't GOGIRL give the womynfolk an unfair advantage in, like, PLASTICS? 1) Can one of these be installed permanently? 2) If installed permanently can the tube be rolled up for travel? 4) Do they offer a variety of color options? 5) Will they be available in multi-unit dispensers? 6) Are they considering franchise options? Captain Craptek is "acting" like he knows absolutely nothing about these devices!! Looks like Rosie lost a little weight but she needs a landscaper! had she, in advance, vant mein sunglass, I vould haf giff zhey (vorever, in zhat case, offkors). Vladimir Ilyich adds: And see my hydrodynamic performance extended! In a bold move, Komradette Putout widens the - formerly constrained - research project of Komrade Chief Designer, now to include also most unequal M-gendered precious bodily fluids. Hooray for inclusiveness in fluidal ballisticity! 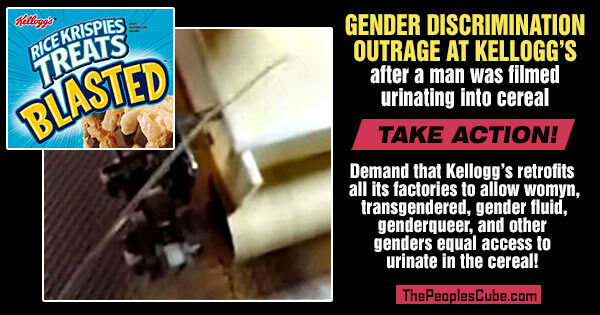 The "contra-equalizatory penilo-urinatory endowment" has farreaching implications! It's not "just" about Physics! See: from toddler-pre-pioneer, through lil' pioneer, then komsomolets, and finally full Kube-Party gulagist - always in touch with his own gender-specific, phallo-accentuated region. It's pure Math: balls, cylindrical structure - and what does Pi (in Old-Continent-Speaks it's still pee, not the IPA-English paɪ) stand for? eh? So, any M-gendered Komrade got basically a stereometry lab right below his navel! Just observing dimensional changes in that cylindrical structure - that itself leads to the intuitive grasp of continuity, a basic Math concept, ja? The dreams of that "cylinder" growing.. bigger.. bigger.. bigger still... - an intro to the concept of infinity (without which you barely have any "mathematics", huh!). Isn't the only way to crush "men" ballistic privilege a fundamentally transformative re-engineering of humanity so that penises somehow grow to the inside, into, like, a vajayjay? Subconscious Freudian extravaganza all over the scene! Phallologic "cylinder"... _in rush to "contact" the Moon... _and need I say what "mooning" is? The dreams of that "cylinder" growing.. bigger.. bigger.. bigger still... - an intro into the concept of infinity (without which you barely have any "mathematics", huh!). It's a shame that in the richest country of the world private parts continue to remain in private property. All the above inequities and disparities wouldn't exist if all private parts were nationalized and become government parts. The outdated term "privacy" must also be replaced with Governacy, which fits a more progressive and up-to-date world outlook. In order to really explore the deep intellectual concepts underlying the foundation and the full meaning of "Governacy" and how it all relates to the requirements of human life and happiness would take several coloring books and a lot of crayons. The concept of "private citizen" is also to be replaced with "government citizen." The outdated version to be decommissioned and no longer accepted. To elaborate on governacy: in order to avoid any future claims of sexual harassment and subsequent resignation of important officials and public figures, all future one-on-one interactions between a man and a woman shall only be conducted in the presence of a specially trained and licensed government representative. Only then private interactions will be considered government-approved interactions. Failure to comply will be deemed a federal crime regardless of whether sexual harassment charges are filed. Yes, this will take a lot of crayons. Is that a (nut-hungry!) squirrel up the pant leg of that misfortunato, or is he just happy to have been touched by "Mae" Putout's famous hard-working brush? Why is everything so unfair? The science is unsettled: Trannies complain biology unfair!